Stella is an excellent self-fertile cherry variety, easy to grow and productive. The large dark red cherries are very juicy and sweet, with a typical cherry flavour. If your only experience of cherries is from a market stall or supermarket then you will be very pleasantly surprised with the flavour of fresh Stella cherries straight from your own tree. Stella was the first of the modern self-fertile cherries, introduced from Canada in the 1970s. Until that time growing cherries at home meant planting at least two different varieties and dealing with the complexities of cherry cross-pollination. Being both self-fertile and having such a good flavour, Stella rapidly established itself as the ideal garden cherry tree, since it could be grown on its own. Although there are now other self-fertile cherry varieties, if you only intend to grow one cherry tree, Stella is still one of the best choices. As well as being self-fertile, it is also a good pollinator for other cherries including the traditional English cherries (most of which are not self-fertile). It is therefore a very good starting point if you think you may add further cherry trees to your garden or orchard in the future. Please fill in the details below and we will let you know when Stella cherry trees are back in stock. An excellent alternative to Stella, to which it is closely-related. 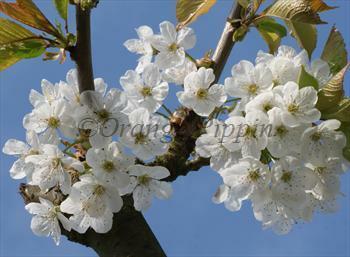 One of the best self-fertile cherry varieties for the UK garden, descended from Stella. Developed from Stella and inherits many of its qualities. Useful if you want a later-ripening cherry. A white-fleshed self-fertile cherry with an excellent flavour, a good alternative to Stella. Stella is in flowering group 4. Stella is self-fertile and does not need a pollination partner, although fruiting may be improved if there is a compatible tree of a different variety nearby. Stella is self-fertile, reliable, and a good choice if you are new to growing dessert cherries. One of the disadvantages of self-fertile cherries is they tend to over-crop, and whilst this might seem like a good thing, it leads to smaller fruits with less concentrated flavour. It is therefore a good idea to thin the fruitlets just after the blossom has finished. Stella was developed by the Summerland research station in British Columbia, Canada, and released in 1968. Its parentage included a self-fertile cherry seedling raised by researchers at the John Innes Institute in the UK, derived from two traditional varieties, Emperor Francis and Napoleon. Stella was the first widely-available self-fertile cherry, and by chance was introduced at around the same time as the first dwarfing cherry rootstock - Colt. This combination revolutionised cherry-growing, because it meant for the first time it was possible to grow cherries in an average garden - thanks to Stella's self-fertility only one tree was needed, and the Colt rootstock kept the height manageable. 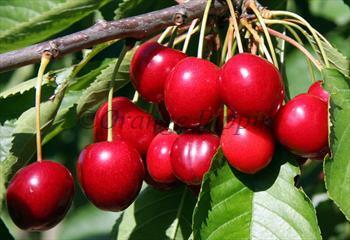 Many modern self-fertile cherry varieties trace their parentage to Stella.